Do your children like to drink a lot of soda or juice? Maybe they have a hard time taking daily vitamins or eating all their fruits and veggies at dinner? Are you worried they aren't getting the proper nutrients? I know my children struggle with all of the above, I think most kids do! I was recently introduced to fizzilicious, and after reading about their fizzy vitamin drink tablets, I knew my children had to give them a try! Fizzilicious is a new drink tablet designed just for kids, they are available in six fruity flavors like Tutti Frutti, Orange, Apple, Lemon Lime, Berry Blend and Strawberry. At fizzilicious they only use natural flavors, colors and sweeteners, their tablets are sugar free, caffeine free and contain no artificial flavors. Your children won't even know they are drinking calcium and vitamins - it's that good! It's simple to create a fizzilicious drink for your child, just drop one tablet of your choice in 6 to 8 ounces of chilled water. Allow the tablet to dissolve completely, watch it fizz - that's the fun part for my kids! Grab a straw and drink it down, we all tried the Berry Blend first and loved it! I personally love the tubes that fizzilicious are kept in, they are easy to store on a shelf and stay sealed until your ready to use them, then just pop one open and drop a tablet into your water! For every fizzilicious purchase, a donation is made to Vitamin Angels to support the health of children worldwide. For over 20 years, Vitamin Angels has been helping at-risk populations in need like pregnant women, new mothers, and young children gain access to vitamins and minerals. Overall, we are very pleased with fizzilicious, I think it's a wonderful product for children and an easy and healthy way to get vitamins in their little growing bodies! So what do you think? Which flavor would your child be most excited to try? Connect: Be sure to follow fizzilicious on Facebook, Twitter, Instagram and Pinterest! Buy it: Purchase fizzilicious online at Amazon! 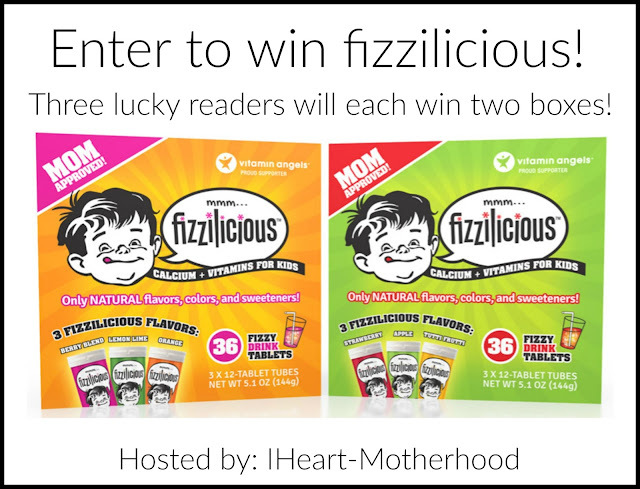 Win it: Three lucky readers will each win two boxes of fizzilicious! !